The gripping account of the U.S. First Army's astonishing triumph over the Germans in America's bloodiest battle of the First World War—the Battle of the Meuse-Argonne. The Battle of the Meuse-Argonne stands as the deadliest clash in American history: More than a million untested American soldiers went up against a better-trained and -experienced German army, costing more twenty-six thousand deaths and leaving nearly a hundred thousand wounded. Yet in forty-seven days of intense combat, those Americans pushed back the enemy and forced the Germans to surrender, bringing the First World War to an end—a feat the British and the French had not achieved after more than three years of fighting. In Forty-Seven Days, historian Mitchell Yockelson tells how General John J. "Black Jack" Pershing's exemplary leadership led to the unlikeliest of victories. Also explored is a cast of remarkable individuals, including America's original fighter ace, Eddie Rickenbacker; Corporal Alvin York, a pacifist who nevertheless single-handedly killed more than twenty Germans and captured 132; artillery officer and future president Harry S. Truman; innovative tank commander George S. Patton; and Douglas MacArthur, the Great War's most decorated soldier, who would command the American army in the Pacific War and in Korea. 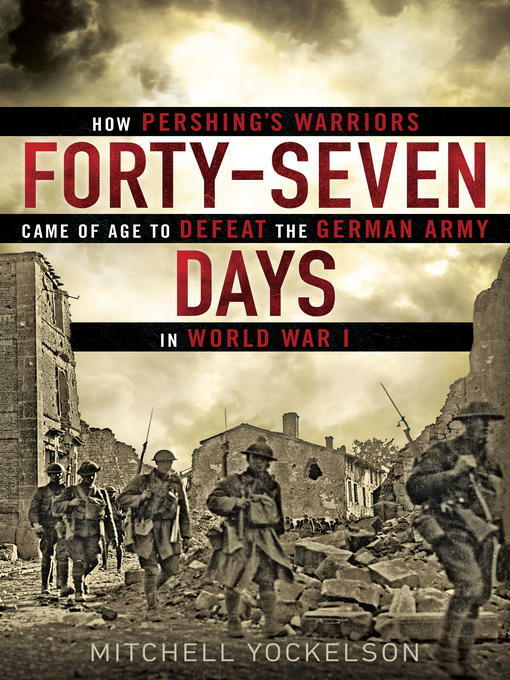 Offering an abundance of new details and insight, Forty-Seven Days is the definitive account of the First Army's hard-fought victory in World War I—and the revealing tale of how our military came of age in its most devastating battle.